God is conceptualized by our mortal conceptions of who he or she may look like. In Christianity, God is generally conceptualized as male, but to be created in his image, God would have to be both male and female. He created man, but this conception of the sense of God was incomplete thus resulting in the creation of woman. The conceptualization of God has been a fascination of human beings since the beginnings of time. The images vary as much from culture to culture as they do from person to person. But can you really humanize, or dehumanize God? The concept has been much debated, and many seek very polar concepts of God in the sense of who he is on this realm of being. But is it wrong or right to create such varying concepts of a God who by most religious texts is unimaginable, who is sometimes both everything and something specific simultaneously. For me at least I don’t perceive God as a perceivable object, at least in the sense of feeling; however, my spirituality is driven by a sense of his existence. Human beings by nature in their ways of understanding concepts that seem or are beyond the realm of human understanding essentially on some level humanize all things in those concepts. By this I mean that people imagine unimaginable things as something they know or recognize in the process of trying to understand. So essentially in all religious concepts human beings apply what they know to what they don’t know, and thus an image of their creator is manifested by their own desires to see them as physical beings. In Christianity and a few other religions there are principles which can inherently draw people into concepts of what God looks like. 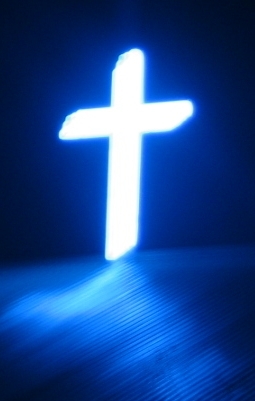 Now refer up to the first image of what is conceptualized of God. It is important to understand the impact of other culture interconnection and the concept of God. Considering concepts of “God created us in their image”, it would lead a person to conceptualize God as a man who is the centralized image of power, leadership, wisdom or other prescribed characteristics as they related to cultural visualization. 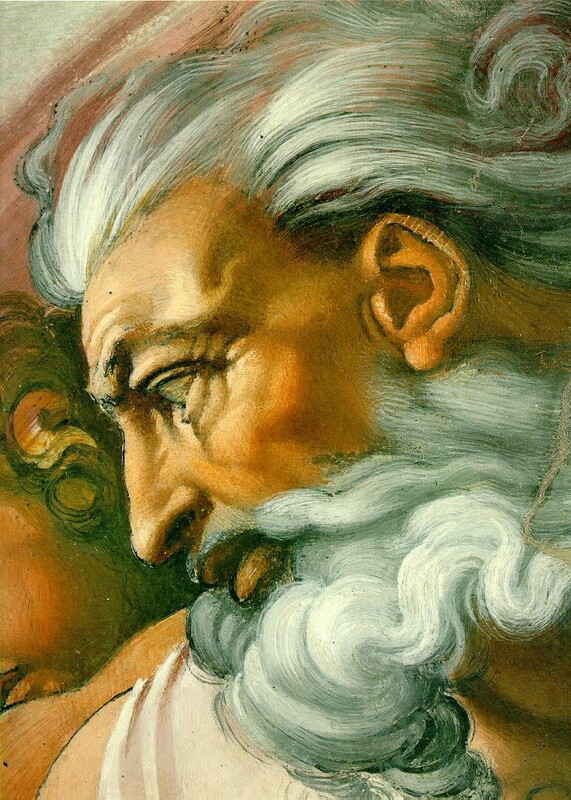 As a result some of the oldest Christian images of God look something more like Zeus. The pantheon of Roman Gods as it relates to Westernized Religion is very important to understand as a bit of time overlap of some of the older pagan and polytheistic religions and current day God concepts. The problem lies in the fact that people forget about even intentionally erase the cross cultural religious implications of alternative religion as the derivative of the concept of God. It’s impossible to put millions of people together without ideological concepts from blurring together. 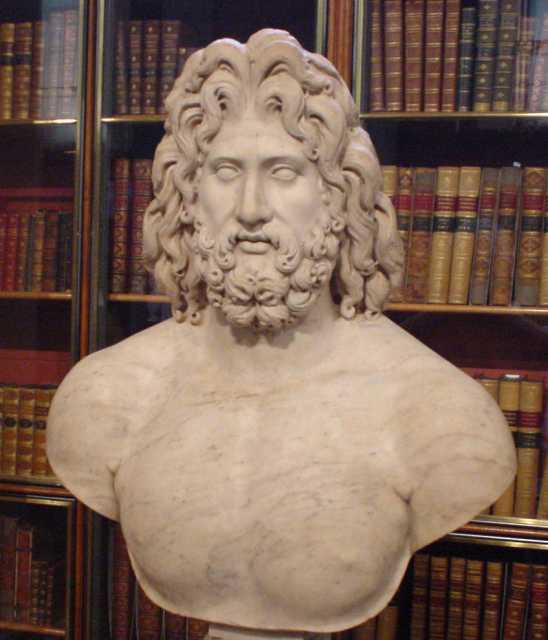 Also, considering the bust to the right, what other historical religious figure does this look like? Most Christians would be reluctance to answer that it looks like Jesus, or the conceptualization of what people perceive to be how Jesus looked. It would seem to me, at least in the concept of art as it relates to deities, is a perpetual process of replication, renaming, and repurposing of theological and anthropological imagery to which the new author claims originality. This goes back all the way to the first religion. It’s a known feature of human concept to imprint upon a supernatural being their own perceptions of the world. It’s also another important concept to understand that over the centuries our world has been dominated by patriarchal societies by and large, so images of God, and of other persons key to religious tenants have a tendency to follow along those lines. To be honest, Jesus is less like a noun in some respects and more like a descriptive title when broken down to its namesake based origins. Also understanding the gender of the word is strongly linked to patriarchy, and it’s word references to God. Savior, a word commonly implied in its meaning is generally considered male, and in an overarching concept of historically positive men are viewed as redeemer, saviors, leaders, and sometimes God-like. Females of similar roles or contributions are identified only in their associations to others as partners and mothers of great men. What I am arguing doesn’t relate to the sexism but to question the subjective genders of words generally deemed to be male. One depiction of what Jesus would have been if he had been a she. This has a strong correlation to God concepts, and how God is depicted. I am not questioning the usage of gender in the bible or other religious texts to the gender of certain words, merely painting a picture that the human experience taints out perception of who God is. For example, noun usage in most Bibles refer to Jesus as exclusively Male. To most this would be rectified by a visit to the chapel to see a priest or in attending regular services. But often, in my opinion, this just further deludes a persons perceptions by opening oneself up to the bias and interpretation of another person. Much can be said for doing self research to understand the practical, and doctrinal practices of your specific religion as they are written in the official texts of your religion. But even in such cases your ideological stand point is going to be skewed. Something does appear to me when viewing concepts of God, Jesus and other historically significant figures, is that they are rather generic of their cultures with engendered deification added to their appearances according to the artists feelings about that figure. 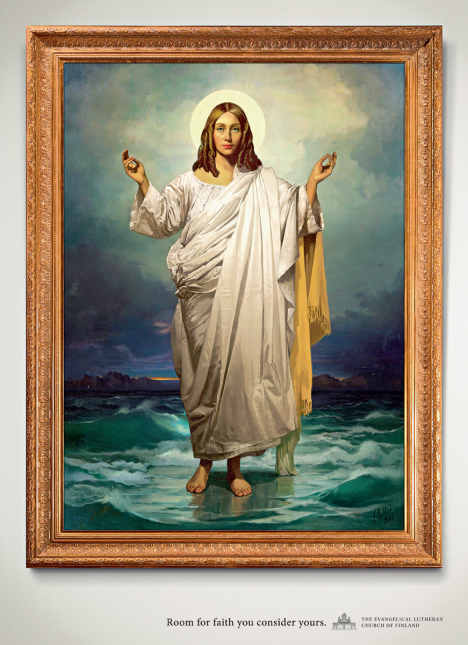 An example of deification in artwork. Religious artwork has a strong tendency for deification, also known as Apotheosis. If you were to take an image of yourself, and edit it to highlight yourself giving it a super natural or God-like appearance this could be a form of apotheosis. You probably know a few people who are narcissistic to a fault who engage in their own forms of self edifying behavior, and the erasure of all perceived personal faults or give the appearance of flawlessness. But this concept goes far beyond the tables and tablets of artists into people’s real world perceptions of other people. I am not advocating Atheism and saying that all religions are a result of the deification of historical figures, but the chance in lies that some religions exist in this context, and it is a high propensity of human nature to deify and make supernatural all things that fall outside of the realm of its understanding. It’s almost written into us to become spiritualists in the face of unexplainable events, but I would argue that all things that are explainable though we may not know the reasons, or be able to feasibly test the situation for valid reasons. I'd argue that this image shows that properties tend to repeat naturally. This contributes to concepts like "The theory of Everything" because scientist and people in generally can see the redundant patterns of nature across all of science. Still no one knows why, or can explain it scientific certainty. Example, my perception of the space-time continuum is water-like. I see space-time as watery, though it doesn’t have the specific properties of water, more so over that it moves or appears like water. Hydrodynamics is the study of the dynamic behaviors and properties of water, and seems to have practical mathematical applications to many areas of science that go far beyond just water. Many things in nature show these causal relationships of density, temperature, and mass and liquid in a sense appears to be a pivotal principal state of matter and energy. The picture left demonstrates a comparison of the hydrodynamic properties of gases as compared to liquids. 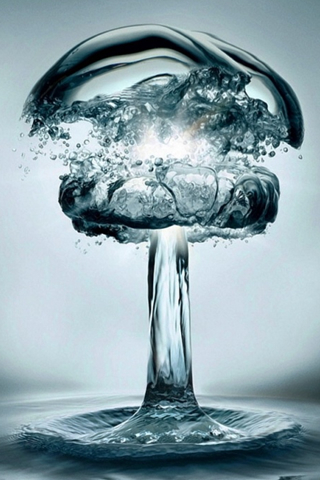 This effect appears to look like a nuclear blast, but is nothing more than the effect of a dropped object, or jet of air being forced into water with the image inverted. I believe that all things could be understood in that sense as water-like in nature, and thus apply this principle to time. However, this perception stems from episodes I had as a child in which I felt time had stopped in which I lost or gained time, or had altered perception of time. In this (Stopped Time), I observed time appearing to be like water, only with flow and patters being a little different. Perhaps it is possible to see time under rare and literally not reproducible circumstances, or maybe I experienced what many people experience also known as an “Absentee Seizure”. I can’t rule out the later, and I can’t prove the former. So why is this important in the God concept. Well, because neurological phenomenon can likely explain many people’s perceptions of God, or in some cases completely refute claims people have to their perceived Religious Experiences. Human beings know so little about our extremely complex brains. Additionally, it isn’t impossible to scientifically reproduce the psychological phenomenon associated with the “perception of God”. There is an article that speaks a lot about this concept in this link, as well as this video. However, proving the absolute of either is difficult in social, moral, and philosophical concept for many dynamic and even controversial reasons. What I am getting at is there is potentially scientific, and quite non-spiritual explanations for many supernatural phenomenon. However, it is possible that the human body can receive signals in ways that defy the impossible, and because we don’t understand these signals our interpretations are as many as the stars in the sky. This is the infamous "God Helmet" used to trip the perceptual sense in the human brain that some scientist believe contributes to the God Concept. The problem is that in an uncontrollable real world environment it's impossible to determine all possible factors. Simply because an eye can detect light doesn't mean it can see images. This can be said for the God concept as well, that because of these feelings, and complex sensory inputs our minds can’t accurately extrapolate they information they are perceiving because they aren’t designed to handle those signals. It would be like using a radio set up for AM (Amplitude Modulation) audio and tuning the frequency of an FM (Frequency Modulation) video signal. All your going to hear is noise with repetitions and amplitudes of only the part of the signal your bandwidth is cross sectioning. So this signal that has picture and audio is going to sound like nothing more than noise to you. I think much of the human experience can be filled with irreconcilable inputs, but that these inputs alone don’t in and of themselves prove the supernatural. Perhaps one day humans of the future will learn to reconcile these mysterious inputs and understand their own mind, but perhaps they won’t. Maybe technology will catch up with us that technology can communicate with the brain with the signals it understands. Who knows. 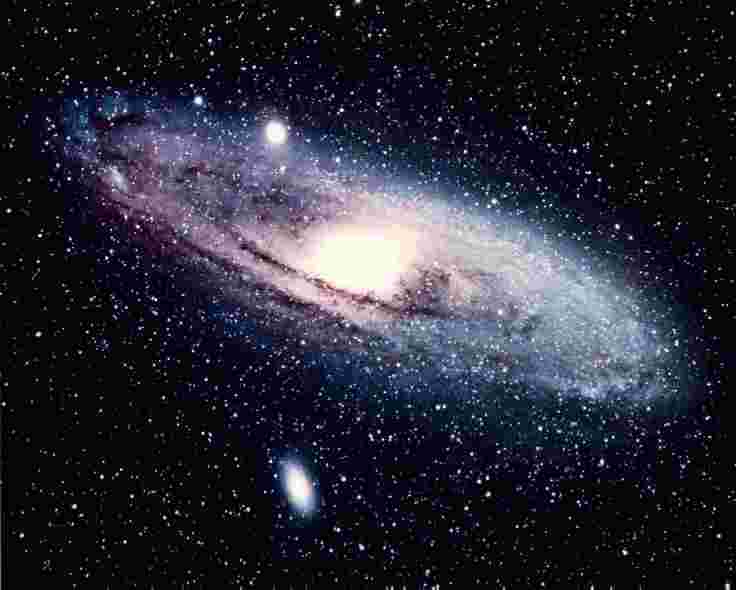 The galaxy is hardly imaginary, but is also hardly explained by human concept. What I should elaborate on, is that as I do with many things don’t argue for atheism any more than I do for absolute religious doctrine mostly because I find the intrinsic logic of both fundamentally flawed. I believe in God, but not because I read the bible or smacked my head and had a religious experience, but because my deeper sense of intuition senses a pattern of organization, and logic that isn’t readily defined without it. Nothing more, nothing less. At least I am willing to admit why I believe what I believe and explain it. Many people can’t because they haven’t done any self-reflection on the issue. I may use, from time to time, the dogmatic logic of religious teaching to show moral lessons, but I seek truth not blind childlike ignorance or scientific absolutism. Principally balance rules the universe, and forces in play are constantly being compelled to a state of harmony. Sometimes harmony is achieved through annihilation, and other times through combination and transformation. This is as clear in life on our planet as well as the relationships between people, cultures, objects, et cetera. In the universe I see there is no natural or supernatural, but just levels of observable and explainable data. The universe exists, but many things about it are a mystery; however, this doesn’t necessarily mean there is a God who is maintaining the cogs of this machine per say. Perhaps the universe is what our minds is conceptualizing as God itself, who knows for sure. As such, I find many atheists statements about their arguments denouncing God as lackluster as Christian Radicals absolutist stance on biblical dogma. Neither can prove their points because of a complete lack of impartiality or because of attempts to either humanize or dehumanize God concept. I watched a video recently that compared God as if he were a human to correlate that if a man behaved as God does he’d be considered a psychopath. What I note is this, believers (faith driven people) embellish upon God’s traits and non-believers (fact driven people) downgrade upon God’s traits. To assume God as a man and then extrapolate how people perceive him is impractical. This figure (God) is described to be infinitely old, present everywhere, and simultaneously aware of all things both 3-dimensionally, and temporally. To assume human psychology, or to assume he cares about things in a human concept as humans do is flawed from the very basics of the concept. Do people of different ages think the same? No, because of experience and knowledge so to assume such things is impossible and completely unpredictable. Likewise, to take a Godly attribute, or moral concept and preach it as an absolute is also totally flawed. Even the most educated anthropologist can only guess at the possible context of the idea as it relates to the time period, and guess at the authors intentions and extrapolate his intended audiences. Religious teachings can actually conflate morality as much as atheistic concepts as their antithesis. Also it's hard to argue a point, or enforce a principle when you follow it with "I think". 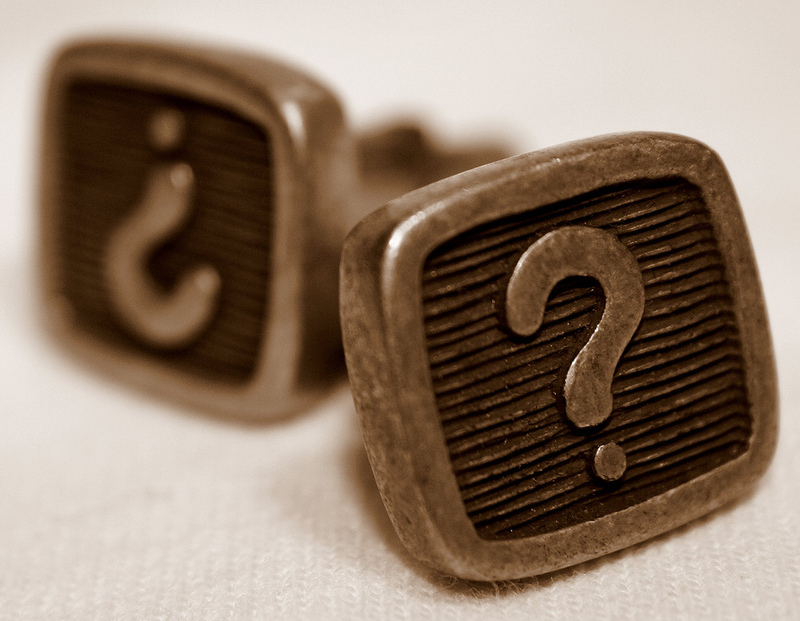 Guessing within its concepts comes with a certain amount of uncertainty. In religious doctrine there is a high tendency to disguise personal motivations as divine inspiration. Everyone likes to be right and dislikes being wrong, even me. But you can end up in a middle null where you can be perceived as being self-righteous never subscribing to either concept on a polarized issue. I neither believe in absolute religious dogma, nor existential atheism. Sometimes it can give the feeling to the throngs gathered around these issues that you are saying they are all wrong, in which case for some proves that you are wrong because of majority rules. God concept and religion involves a lot of majority rules which basically state that so many people can’t all be wrong. Once again, might doesn’t equal right. Just because most people believe in a concept doesn’t mean that it is true, nor does it prevent a person from having independently correct knowledge (being a singularity of knowledge among unknowing masses). Jesus himself proclaimed to be a “conscious singularity” by being who he was. However, to make such a claim applied to any other person the concept receives intensive scorn in absence of deity status. In fact, to the people of the times who didn’t believe Jesus he was a fraud on the grounds of majority rules, while those who believed were the minority. Religious radicals argue that anything they don’t agree with as evil and the work of an antichrist, or devil perhaps even “The Devil” – the greatest evil antithesis to God. Sometimes this is even in the defense of prejudice and crimes perpetrated against others, that they are doing it for the greater good. It is okay to say that a fact or detail is true, but wrong to say that your interpretation of that knowledge is. The sky is blue but your perception of it may be different from everyone else’s. The same applies to Atheist when it comes to their interpretation of God/Gods from the religious texts, religious participants, and available resources about the topic (that it would be wrong to assume anyone’s interpretations are flawless.) Not all religious people or non-religious people fall into such flawed ways of thinking, but it is a problem. So you end up back at a nullification point where neither side can absolutely prove their case either way, and the powers that be remain polarized on the issue. What is key to me here is this… Humanity is trying to define itself, both progressively with each generation, and as people. Also, that there is something inside many of us that we are trying to rationalize which is largely unexplained, and that religion is a byproduct of this correlation. There is also a subtle overarching pattern to all world religions that seems to be substantially linked to the human condition that relates to the sense of something greater, concepts of universe and god, and of an intangible afterlife. This leads me to believe there is a reason for these concepts; however, science can neither prove nor disprove the reason or relationship for this. Therefore, in some ways, we are left in an inexplicable void in our otherwise observable universe. But nothing is unexplainable or supernatural, just unexplainable for now; something which history proves time and time again does change and understanding can be found. Humanization, dehumanization, and apotheosis are hardly concepts confined to personal and social concepts of God. People do this to each other as they subjugate some and exalt others above and below the standards of humanity, and have done so likely continuing to do so.